E-cigarettes, sometimes called e-cigs, are a battery-operated device that is often marketed as a safe alternative to traditional cigarettes. As a result, they have become increasingly popular, especially among younger people. Using an e-cigarette is called "vaping." The Centers for Disease Control and Prevention have reported that over 2 million children in middle and high schools have reported using e-cigarettes in a 30-day period. However, e-cigarettes are not approved by the FDA in order to help quit smoking, and there is currently not enough evidence to recommend their use for stopping smoking. If you believe that you may have been harmed by using e-cigarettes, you may have a basis to sue the manufacturer, just as you would based on a defective drug another product. The e-cigarette injury lawyers at Moll Law Group are experienced advocates for injured consumers in product liability lawsuits. Billions of dollars have been recovered in lawsuits in which we have been involved. A new study suggests that e-cigarettes could harm your health. NYU School of Medicine researchers discovered that the DNA of mice exposed to e-cigarette vapor was damaged, thereby potentially increasing the risk of lung cancer, bladder cancer and heart disease. In the study, the researchers exposed 10 male mice to e-cigarette vapor that contained 10 mg of nicotine, which is comparable to what human e-cigarette users absorb, for three hours each day, five days a week over a period of 12 weeks. This group of mice was compared to a control group that inhaled filtered air. The researchers found that the mice exposed to e-cigarette vapor suffered DNA damage to the heart, bladder, and lungs. This kind of damage was also found in cultured human bladder and lung cells that were exposed to the same type of vapor for the equivalent of a decade. The researchers also found that the exposure stopped DNA repair processes in the exposed mice's lungs. This outcome was the same as when testing long-term exposure to the vapor on bladder cells and human lungs. The researchers believe that e-cigarette smoke is carcinogenic and that these smokers have a higher risk than non-smokers of developing heart disease and bladder and lung cancer. However, a critic from the Tobacco Dependence Research Unit at Queen Mary University of London has argued that the study does not show that vaping actually causes cancer. Our e-cigarette injury lawyers recognize that a high percentage of smokers believe that e-cigarettes can help them quit smoking, and almost all think that using the device can help reduce the use of traditional tobacco. However, this new study as well as two other studies suggest that e-cigarettes may be more harmful than people think. One study from last year linked the flavoring of e-cigarette liquid to impaired function of the heart. Another study claims that it found substantial evidence that using e-cigarettes increases heart rate and that certain chemicals in the vapor can hurt a user’s DNA. You may be able to recover damages for harm caused by e-cigarettes if you are able to prove that there was an actionable defect. Consumers hurt by defective products may be able to sue and recover damages from any business entity in the chain of production and distribution, from the original manufacturer down to the retailer. Actionable defects are marketing defects, manufacturing defects, and design defects. In the case of e-cigarettes, the primary issue may be whether the manufacturer failed to provide adequate warnings about the risks of vaping. Consumers injured by an e-cigarette may be able to hold a manufacturer strictly liable with the assistance of an e-cigarette injury lawyer if the manufacturer did not provide adequate warnings about the risks of vaping. 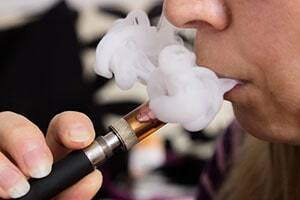 Consumers may also have a claim for design defects in connection with harm caused by e-cigarettes. Whether there is a design defect may depend on the outcome of either the consumer expectations test or the risk benefit test. With the former, a product tends to be found defective if it does not perform as safely as an ordinary consumer would expect. The risk benefit test is for more technical or mechanical cases, and it requires juries to balance the product's positive aspects against its negative aspects. If you believe that you were injured or a loved one suffered a wrongful death due to the use of e-cigarettes, the injury lawyers at Moll Law Group can examine the facts of your situation and evaluate whether you may have a viable claim. Our law firm pursues remedies for injured consumers all over the country. We serve people in states like California, Florida, New York, Illinois, Texas, Pennsylvania, Ohio, and Michigan. Call us at 312-462-1700 or complete our online form.